Wandering Wednesday is almost over, t-minus 34 minutes and counting here. I’m sitting here eating some chocolate ganache cake with marion berry drizzle wondering where to start as this day was busting at the seams! So I’ll start with the beginning. Wednesday is a transition day at our home, Mars goes to the other home after school (or as it’s titled “The cottage”) I live in the “Big House” which either brings in mental images of jail or a big house. It’s neither of those, it’s just bigger than her other home. I didn’t title them ;) We live in a different quadrant then school and work so our commutes give us more time to share. We like to listen to music (for which she gets a song and I get a song, and this repeats), tell a story or two and chat/giggle. She has this grin she gives me when I look at her in the review mirror = priceless. The commute to school is about 20-30 minutes then another 10 for me to get to my office. Sometimes I’ll take a quick detour and indulge in breakfast at one of my favorite little eateries, but today was no such day. I had a schedule to adhere to. Work was work, but I left on time and almost finished everything I needed to be able to leave on time tomorrow; I’ll be hoping on a plane to Omaha for a sisters’ weekend. Man alive I need it! Leaving on time was important because I had a pedicure appointment. When I inquired about the weather in Omaha, I was surprised to find sunny and in the late 70’s… that’s double what it is here. I decided my soon-to-be sandal wearing feet could use a little extra pampering as I’ve been in boots the whole winter. The Salon/Spa I like to frequent has an amazing esthetician, Kunka. She’s from Bulgaria and I’ve been going to her since living here. As she placed my feet in the warm bath she then insisted that I enjoy a little bit of wine, bringing me a goblet full of chardonnay (a fave of mine), I reclined and just enjoyed these few minutes. I then begin to chat with the young lady next to me. Come to find out she’s a pharmacy technician looking to become a registered nurse and work with hospice patients. She recounted the tale of her grandmother’s last days and how the system let her slip through the cracks. Mary, the young lady, vowed that no one should have to go through that, the emotion and passion was palpable hearing her talk of her desire in a career change and the impetus for it. She did get accepted into pharmacy school and declined the admission. I could feel that her heart was really in working as a “compassionate companion” as she termed it. We parted ways with sparkling toes, mine OPI wocka wocka (a deep shimmery purple) and hers pale pink, wishing each other luck in our future paths. On our way out, I found out she liked to take photos, that her creative outlet was photography and piano. I mentioned how I’ve always wanted to develop that ability more and she replied “just take pictures of what you love, put love in it”. I smiled thought, okay so pics of my little girl. No issues there! Hobbling out of the spa I then stocked up on travel size toiletries, as I am not going to check my bag no matter how many pair of shoes I convince myself I need. (so far, three pair for 3ish days) I know, I’m hopeless, but I haven’t over packed on this trip…yet. 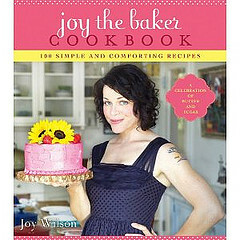 I then realize I have enough time to grab a coffee and head out to a local bookstore for a signing of “Joy The Baker Cookbook” by Joy Wilson. I follow her blog and if you’re not familiar with her name I have her listed on my blog list. Here’s a few quotes from Joy sharing at the book signing that were smile inducing as I wrote them down in my journal. ~don’t tackle too much, especially when hungry. Eat a snack then try making pizza from scratch, otherwise you’ll be a pissed off pizza maker just wanting to eat rather than create. ~if you really don’t understand the recipe, don’t try it unless you’re not committed to the outcome. ~that in buying her book, we’ll all need to buy more butter. ~advice for aspiring bloggers (where she got her start): be you, don’t compare yourself to other blogs, it’s not about super fancy but you, bring you and what you have and that’s all that’s needed. Her latest blog was about being in her hotel eating tortillas as she was a little bit nervous… I then told her while chatting that one night I was wanting something sweet and couldn’t put my finger on it until reading her blog and seeing biscuit cinnamon rolls. I didn’t have the ingredients (buttermilk, adding that to my standard list!) So I took out a wheat tortilla, smothered it with butter and then sprinkled cinnamon and sugar, put in microwave (wish I had a toaster oven) and then cut it in little rolls, a good faker baker as I like to say. It did the trick and I vowed in the morning I’d bake something. Yeah, we bonded over tortillas, my shiny black clogs and blogs. I think it’s so inspiring to be around those living out their dreams, it could be anything… as we’re all different. I read the term “hobbyjobby” and thought you know, sometimes we don’t have the luxury of being able to sustain our life with our passion, but we can still infuse our life with as much as possible and you never know, Joy started with 32 followers on her blog in the first few months and now she’s named the best baking blog by Foodbuzz, Top 50 Food Bogs by The London Times and has a cookbook, but she started with what she had and let it unfold in time. Dreams infuse the sands of time, clarity comes with patience, in allowing the pattern of creation to unfold according to its design. Well, now it’s Thursday but I’m not going to change the title. Sorry, not gonna do it, lol.